We conceived the project for the client, Taylor Wimpey Central London, to engage every primary pupil in making personal creative responses to the development happening immediately around their school. Like the school we were keen for the children to experience working with a professional artist to support their creative learning. 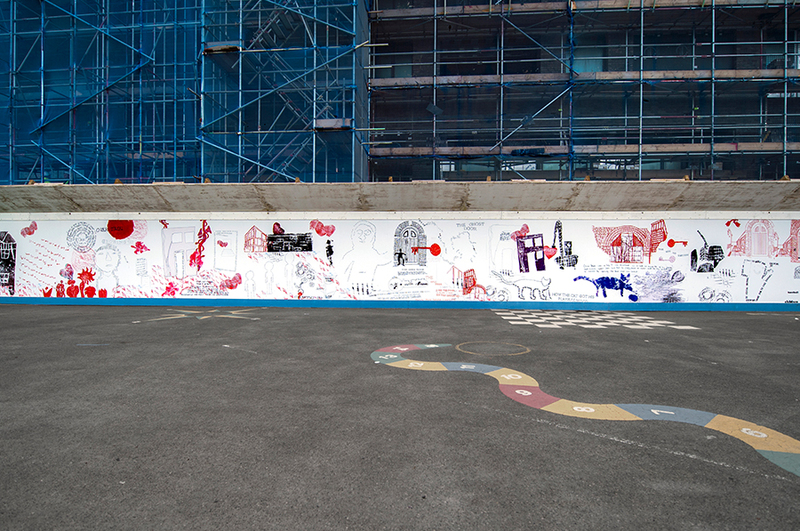 The hoarding artwork would help to soften the impact of the construction underway alongside the school and its playground. Moving Walls was the first project delivered through our cultural strategy for Taylor Wimpey Central London’s Battersea Exchange development. Partnering with the nearby Pump House Gallery, artist Orly Orbach was selected as an artist in residence. We were struck by her ability to find ways of engaging people with limited arts experience to bring creative narratives come to life. Over two terms every pupil in St Mary’s RC School worked with Orly to create the unique large-scale artwork. 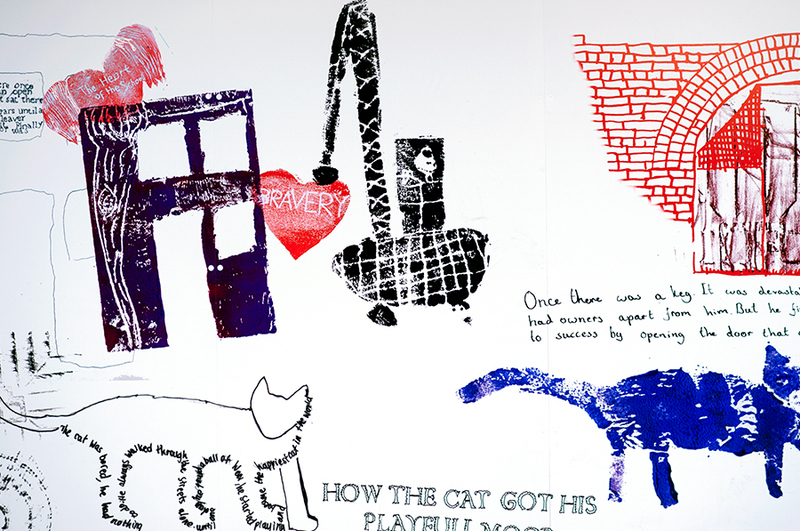 Using a variety of printing and image-making techniques, she helped them to explore the changes taking place around them as their new school building was being constructed to replace the existing one. Orly chose to explore the idea of the life-cycle of the school, considering the school as alive, growing, being loved, falling into disrepair and a new school being reborn. Through workshops, Orly led the students to create narratives, prints and drawings that documented and reflected on these imaginings, as well as changes in nature, the built environment and their lives. Themes and techniques such as collecting rubbings of different surfaces in the school, mono-printing and creative writing were developed with teaching staff, to suit each class and ensure meaningful learning. Years 1, 2 and 4 focused on changes in the natural environment, Years 3 and 5 on the built environment, and Year 6 students reflected on their feelings about the changes around them. The final artwork was compiled digitally, weaving together collected works and printed onto largescale panels. 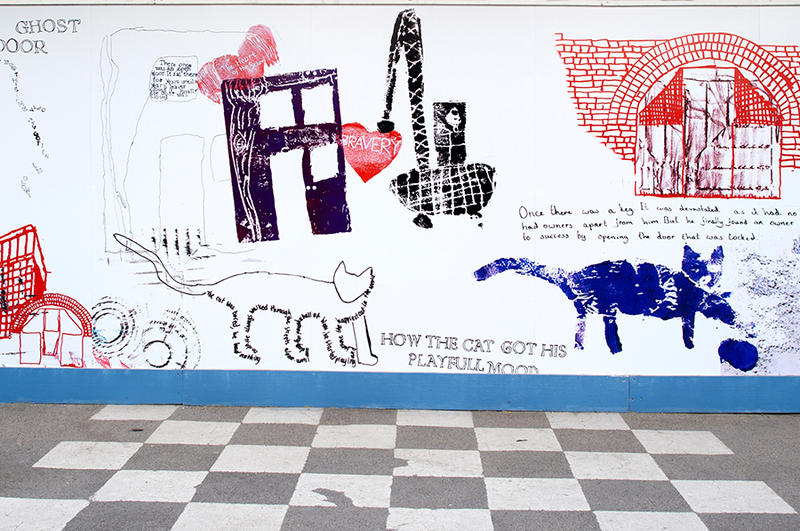 This allowed the artwork to be moved and reconfigured as the building works required the hoarding to be adjusted. A celebratory event was held to which all school staff, pupils and parents were invited, as well as the artist and client bringing the community together. Envisaged as a series of connections, our cultural strategy for Taylor Wimpey Central London has sought to put culture at the heart of a new mixed-used neighbourhood in Battersea. Centred on the rebuilding and enlargement of St Mary’s primary school, Battersea Exchange provides new homes and commercial space on a former brownfield site. The cultural strategy sought to embed creative projects and community engagement during the transformation. 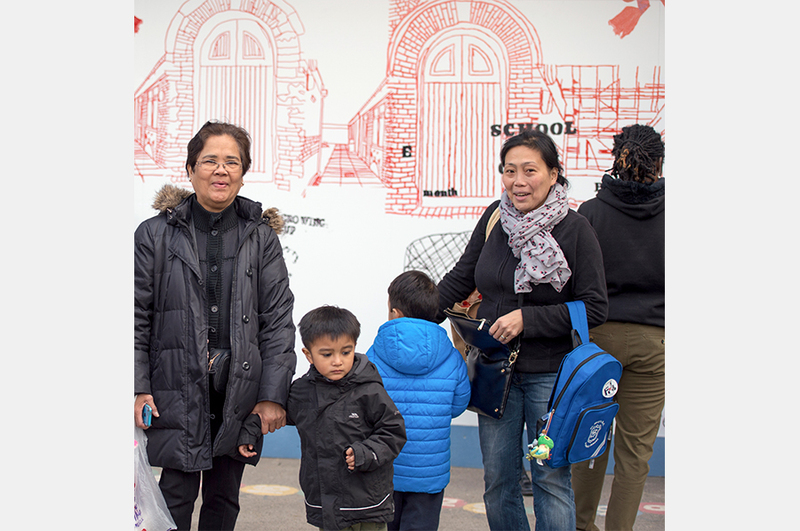 Moving Walls was one way that we supported the client to engage creatively with the local community and the approach was well received by the whole school and local families. “We were struck by Orly’s ability to find different ways of engaging people who often have limited arts experience, and helping them to bring to life creative narratives which reflected on their personal experience of where they live”. 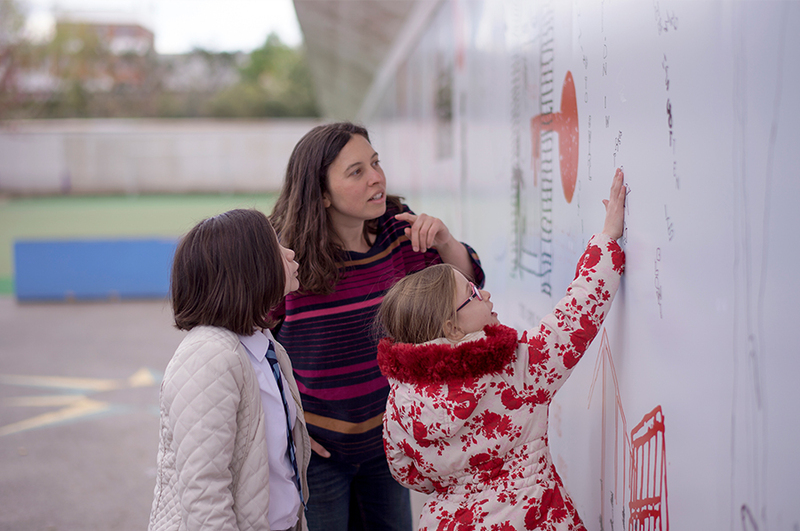 The Moving Walls artwork softened the timber construction hoarding and took the students through a process of thinking about the development underway around them and how the area and their daily experience in it would change. The hoarding was in situ for six months, prior to the school community relocating into their new building.